I made this cactus cake for my good friend who commissioned me to make a birthday cake for her husband and son’s combined birthday party. Cake baking is relatively new to me. I just started this year and I have fallen head over heels in love with baking and frankly, I might be a little obsessed. My favorite decorating technique is making buttercream flowers. So when I was given this new project, I was constantly brainstorming on how to make a cake that would be appropriate for a 35 year old man and a 3 year old boy. I asked my husband, “What is the manliest flower or plant you can think of?” He looked me square in the eye and responded, “Venus fly-trap”. A buttercream Venus fly trap did not seem to be too appealing to me, so I asked again and he gave me the brilliant idea to make a cactus. I took the cactus cake idea and went with it. Looking at cactus pictures for inspiration, I thought it would be cute if I made a tall cactus to represent the father and a short round cactus to represent the son. After much research, it was time to bake the cake. As requested, I made a delicious 3-layered chocolate cake with Nutella Swiss meringue buttercream as the filling. 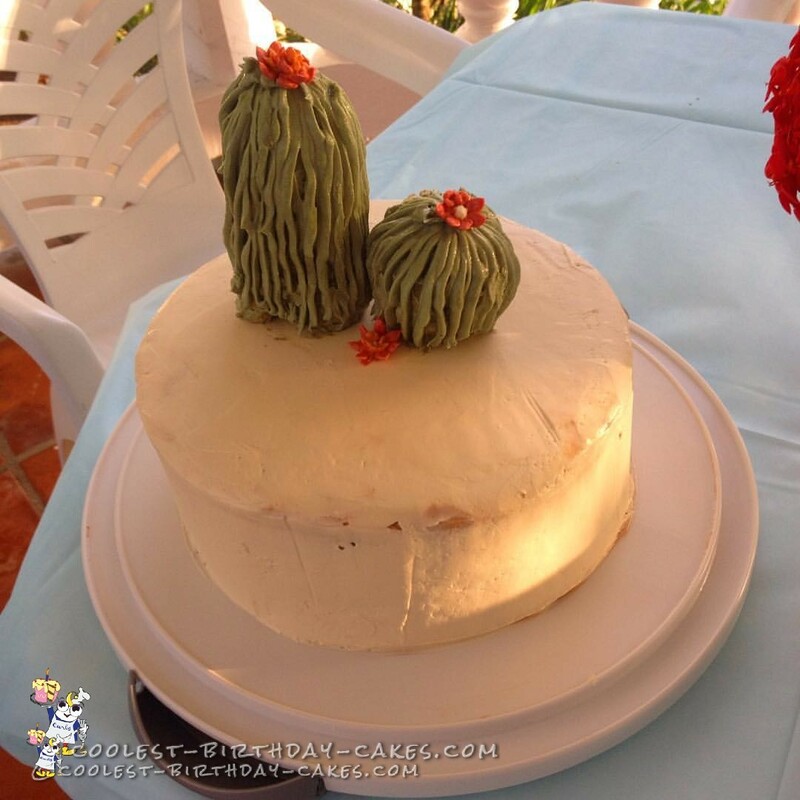 I then coated the cake with vanilla Swiss meringue buttercream (I love Swiss meringue buttercream) and prepared to make the cactus. I molded each cactus with Rice Krispy treats and piped buttercream over them. As I was about to put the frosted cactus in the freezer, it fell and rolled down my arm. There I was covered in green buttercream, about to cry, knowing the cake needed to be delivered within 30 minutes. I stared at the mess for about a minute and gave myself a pep talk and redid the cactus. This time, I slowly placed the cactus in the freezer and successfully planted them on top of the cake. The cake was a huge hit. Everyone complimented me on how cute it was and couldn’t believe that I, an amateur baker, baked the cake from scratch. Once it was time to eat the cake, the moment of truth, I was relieved by the unanimous “Mmm”. All the prep and baking I had done, whisking meringue by hand (I have no stand mixer), baking the cake, frosting and decorating took a total of 6 hours and the cake was gone within 10 minutes. But, it was totally worth it.